1 How to Use a Jigsaw: The Easiest Tutorial For Newbies! The Jigsaw Itself :You can go with most any brand as long as it's dependable and gives you more cutting value out of your money. Budget : It costs you between $20 to $100 depending on the cost of the material you're cutting and the price of the jigsaw itself (including accessories). Jigsaw Blades :Speaking of accessories, you need a regular supply of jigsaw blades handy so that you won't end up with a dull blade that ruins the work piece you're cutting. Pencil or Marker : It's used to mark the wood for cutting. You can create or trace the pattern with it. Masking or Painter's Tape :The tape is there so that you can put it over the surface of a work piece you don't want to mark and draw the pattern on the tape. You should use the right blade in order to cut through various materials. 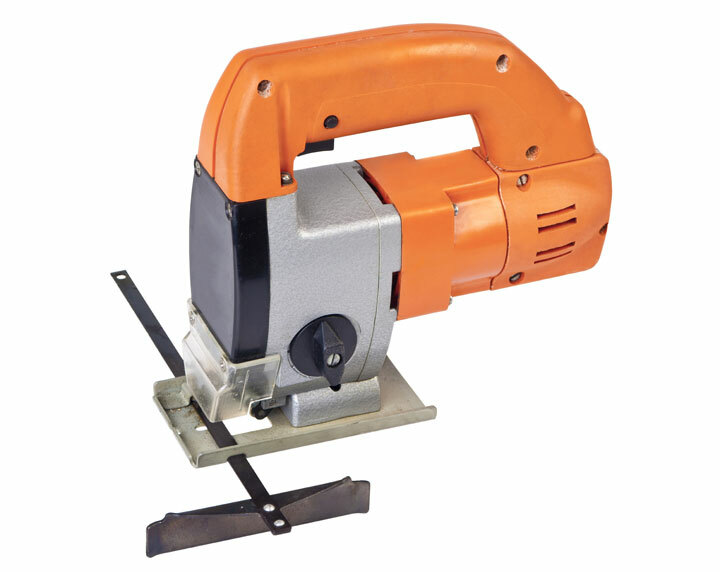 Many wood cutters have blade that have teeth that slice on the upstroke. Down stroke cutting is required for dealing with wood veneers or any fine work requiring less chipping on your part. You should also choose the right blade for cutting thin tiles or metal that your other saws are too cumbersome to deal with. The more teeth per inch your blade has the better suited it is for dense materials. A coarser blade ensures that the cut is done quickly. You'll need more sanding later the coarser the blade you use. Jigsaws work best when it comes to cutting complex shapes or curves unto the wood. If you want a straight cut, a jigsaw can do that too but it's better to go to a table saw or some other saw type to ensure the straightness of the cut. You can also use these jigsaws for short board crosscuts to boot as well as doing the finish of the inside corner cuts. The longer the straight cuts the less ideal the jigsaw is for making such cuts while maintaining the straightness of the cut. A mini circular saw is ideal for that scenario. You can use jigsaws specifically for cutting hardwood that's ¾ inches in thickness or softwood that's 1½ inches in thickness. Keep the blade from binding on tight cuts by removing waste or doing relief cuts. Aside from choosing the right blade, there's a technique you should follow when cutting wood with a jigsaw. First, keep the shoe on the work piece. Second, cut the wood in smooth curves by pressing the saw shoe in a firm manner over the piece with the saw moved away from the edge. From there, turn on the power tool's motor and cut along the cutting line you've penciled as a guide. You will sand that part later to smoothen it out further. Move the power tool to the inside corners from the curves you've just made. Always manipulate the jigsaw in a forward direction while keeping up a pace that enables the saw blade to cut without deflection. The cut should be smooth and lacking of motor labor. When cutting thicker, denser boards and doing a tight curve, the blade of the jigsaw has a tendency to bend. This will leave you with a beveled edge instead of a squared one. To ensure the squareness of the cut, sharpen the blade or buy a new blade. This will prevent bending and keeps the saw straight throughout the curved cut. In regards to making a plunge cut or a cut that doesn't reach the edge (a cut in the middle of the board or work piece), put the entry saw cut into the middle of the object. Afterwards, tip the jigsaw in order to keep the blade parallel to the work piece itself. Let the weight of the power tool on the shoe's front lip. Turn on the saw at maximum then tilt the shoe to stab the blade into the wood. Plunge cuts should be used for rough work. The jigsaw should be kept away from expensive polished woods since they could mar or slash them. Instead, plunge cut the rough work piece and polish it up afterwards to hid the marring and fix the slashes with sanding. If the material is fragile, drill a ½-inch starter hole first. 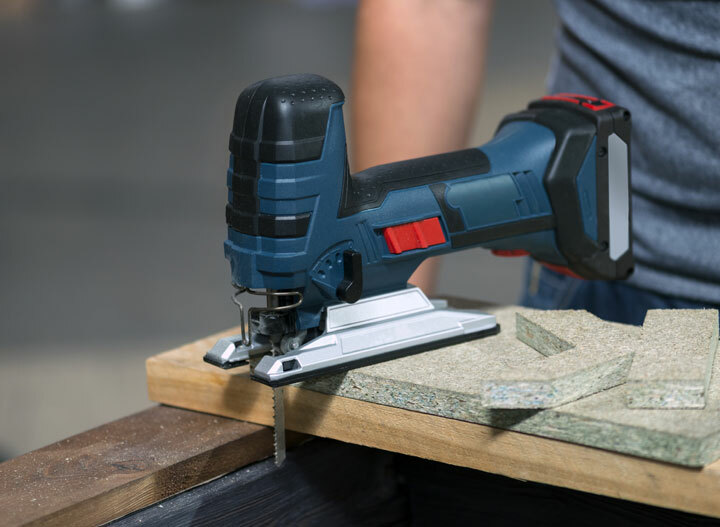 This way, you can safely position the jigsaw to make the cut correctly the first time without breaking apart the particle board or some other brittle work piece. You can also draw a pattern line on the cutting path without ruining the surface of the polished work piece by putting in masking tape or painter's tape over the surface then drawing the pattern line. Remove the tape afterwards after cutting is done. How to Use a Jigsaw: The Easiest Tutorial For Newbies! A jigsaw is usually brought out when cutting an intricate pattern or sawing a countertop for a kitchen sink using a plunge cut. Its versatility is unquestionable. Even novices can operate it once they're briefed on how to use it. It normally takes an instant to learn how to use the jigsaw because it's not a complex thing to do. They don't require extensive training; just tips outlined on a guide like this. With that said, you should pay attention to the blade attached to your power tool to ensure you're getting the job done. Follow the tips and tricks above in order to know how to cut metal, ceramic tile plastic laminate, and wood properly.